Creatures in the library can used to spawn copies (or "instances") on a map by click-dragging the creature from the Library to any point on the map. Spawned instances of creatures do not affect the master in the library, so if you want to make permanent changes to a creature, either change the master in the library or edit an instance and then Save it to the library (Right-Click-> Location-> Save Creature). Create: button creates a new creature called Unknown in the My Creatures module. If you have any filters on, d20pro will prompt you to clear them to see the new creature. Import: allows you to bring in any creatures that you have previously exported. Clicking this button will open up a window that allows you to browse to where the exported creature is stored. 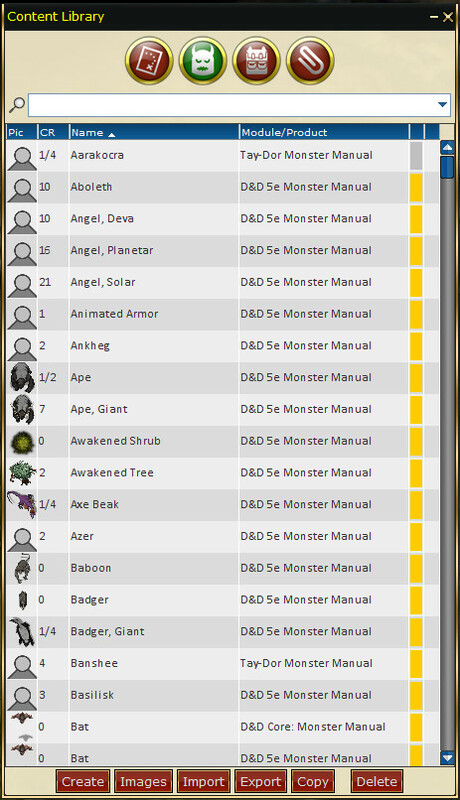 Export: saves your creature to a .d20p_ctr file into a folder you specify. This file can be sent to another d20Pro user so that they can import it. Copy: Creates a copy of the selected creature. Delete: Deletes the selected creature from the library. Be careful deleting creatures, there is no way to recover a deleted creature. Tokens from Purchasable product and/or that have Purchased art are encrypted and can NOT be exported.